OPEN CALL! Become a Southern European Regional Representative. Would you like to become more involved with what happens in IFSA? A new opportunity is here— you can now apply to become an IFSA Official for the 2018-2019 period! We are on the search for TWO Southern European Regional Representative (RR). This is an individual who is based within the Southern European region and able to act as the vital communication and information link between IFSA 7 and the Local Committees (LC) in his/her region. Please find the full list of duties, responsibilities and tasks beneath. Being an RR is a fun and exciting role which allows your to grow personally and professionally whilst gaining a deeper understanding of IFSA. 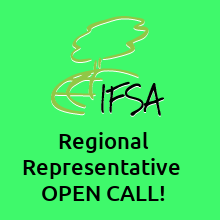 You are a vital component within the IFSA network and we welcome your application! You must provide the following documents. Both documents (1 & 2) must be submitted as a SINGLE PDF file. A letter from your Local Committee (LC) President verifying that you are a member of the LC. A three (3)-minute video about your motivation and the strategy for the position. Why do you think that this position is important for IFSA? How much time will you be able to commit to carrying out this position’s tasks? Why would you want to become an official for this position? How would you achieve this position’s main tasks? Do you think you have the right skills for this position? What are they? What international events are relevant for your position, and will you be able to attend them? What, from your understanding of the role (and in case of Liaison Officers, the understanding of the partnership) do you think your work will be focused on? What would your key goals for the year be? Time management advice: Approximately 5 hours per week, even try to check your inbox every single day. At the beginning, write an e-mail to every LC to introduce RRs and ask them to send you brief information about their activities, problems and what they are expecting from you. Contact the president of each LCs and ask him/her to inform RRs if the contact person changes. Especially in the beginning of year. If some LCs doesn’t reply to your email, you can try other method: asking to a friend who is studying in the LC, contacting through Facebook, Instagram, WhatsApp etc. The official list of IFSA member LCs are kept in the membership database accessible by the membership councilor. Report your region’s current situation to IFSA7 as well as to the ifsaworld. Encourage local initiatives and regional forestry student meetings to improve exchange and communication within each of the IFSA regions. Encourage the members to attend meetings like IFSS, Regional Meetings, Conferences, etc. and to seek for accessible funding to sponsor members to attend. Improve communication within and between each IFSA region. Ensure good communication with existing LCs. Are you using the right communication channel? Does everyone get the information needed? Ensure communication is provided and improved with potential members that have shown any interest. Participate in monthly coffee hour sessions or online forums to encourage, share ideas, and make progress towards greater regional coordination of events. Consider about new membership applications and direct them for a suitable approving by Council. Reply to any needs, which need your attention as soon as possible. Create time to check your inbox regularly. As the demand for regional partnerships has grown in recent years, Regional Representatives are encouraged to engage with regional partners in close communication with the IFSA 7. Deputy RRs or deputy LOs within the region are one possible way forward in handling partners that are only relevant to 1-2 regions.